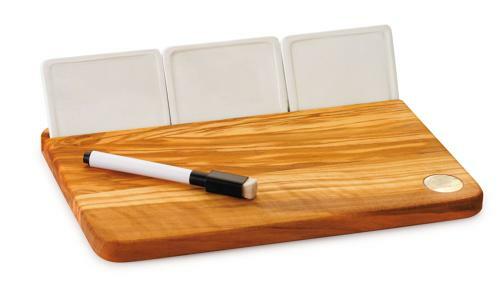 CHEESE BOARD OLIVE WOOD SERVING BOARD - Distinctive olivewood board with three removable glazed white ceramic inserts to write the name of your favourite cheeses or apetizers. Wipeable pen included. Boxed. The new Acero Collection from Bérard France combines the natural beauty of olivewood with sleek stainless steel accents to create eye-catching pieces perfect for entertaining.